ZigWheels brings you yet another exclusive as we bring you the very first pictures of the soon to be launched new Aveo U-VA/ Sail hatchback on Indian soil. Now the current Aveo U-VA has been around for quite some time now and has gotten pretty long in the tooth. Not to mention with some pretty good competion out there the U-VA was pretty much struggling. With the new car however, GM wants to change those things. GM hasn't gone all out as far as the design goes and the new car is anything but radical especially when you compare it to the snazzy Beat. The overall silhoutte is pretty similar to the current car albeit with some sharp and not to mention good looking creases. The front gets the typical family grille which makes it look rather pleasing. Interiors look quite roomy, however fit and finish can only be spoken about once the car is out officially. Now this isn't a special product for the Indian market. In fact, the car has already been launched in China in both hatch and sedan variants. The car has been specifically devoloped for emerging markets like China, India and Brazil. Expect 1.2, 1.4 petrol units accompanied by a diesel unit to power this baby. The Hatch is expected to be followed by its sedan variant which will go up against the likes of the Tata Manza and the Maruti Suzuki Swift D'zire. From what it seems, the car definitely has the goods to be a volume product but it all depends on how GM plays the pricing game. Keep watching this space for more. 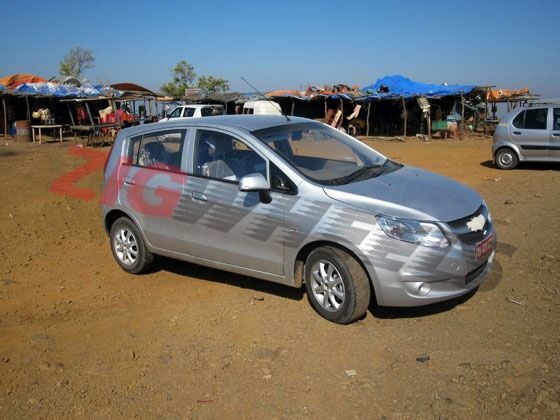 Chevrolet Sail UVA : ZigWheels First Drive Pics!